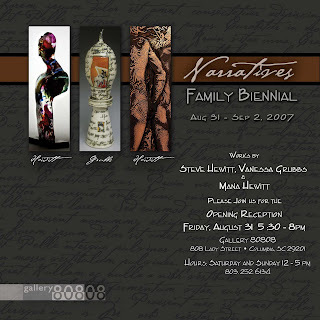 Gallery 80808 is pleased to announce this weekend exhibition featuring work by Mana Hewitt, Steve Hewitt, and Vanessa Grubbs. For additional information: Please visit the gallery website at www.gallery80808vistastudios.com or call (803) 252-6134. Free parking is available after 6 PM in the city owned lot located diagonally across Lady Street from the gallery…but entrance to this lot is off Washington Street across from the police station.